We announced earlier this summer that the toll on 400 is finally coming down and guess what? It looks like the Georgia government is actually on schedule. This toll has caused heartburn for millions of Atlantans over the years, and it is finally coming down. Here’s the announcement we received on Sunday evening. 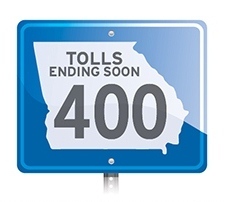 “Beginning on Friday, October 18, portable message signs will alert motorists to pre-construction activities for the ending of tolls and the demolition of toll booths on GA 400. The first phase of a four-phase demolition project will begin on Friday, October 25, with restriping to create a third lane in the Peach Pass electronic lanes and modification/removal of redundant signage. In July 2012, Governor Deal announced that the state would pay off its bond debt and end tolls on GA 400 by December 2013. The ending date for toll collection has been tentatively set for the week before Thanksgiving, weather permitting. Southeastern Site Development, Inc., of Newnan, has been contracted for the construction component of the project and will be managed through the Georgia Department of Transportation (GDOT). Phase I of the project will include the restriping in the electronic Peach Pass lanes and the removal or modification of about one third of toll-related signage from areas approaching the GA 400 Toll Plaza within the next two to three weeks. A total of 66 signs will be removed or modified before and after toll collection ends the week before Thanksgiving. In Phase II and III, preparation for no tolling continues with the completion of restriping and the installation of concrete barriers between the Peach Pass and cash lanes in anticipation of the eventual shifting of traffic into the electronic lanes when toll collection ends. Once traffic is shifted, no heavy demolition work is expected to take place during the winter holidays. In Phase IV, toll booth demolition, which includes removal of plaza toll booths and canopy, as well as reinforcement and filling in of tunnel stairwells, is expected to be completed between January 2014 and Fall 2014. The public can learn more about the demolition project at the upcoming public information open house meetings on the demolition project is scheduled for Thursday, October 24 from 4:00-7:00 pm at the Crowne Plaza Ravinia, 4355 Ashford Dunwoody Road in Atlanta. To recap, if things stay on schedule then no one will have to pay the tolls on 400 by Thanksgiving. Now that’s something to really be thankful for.